While the global plug-in electric vehicle (PEV) market has been growing for several years, its continued expansion faces threats, caught up in potential trade wars and a roll back of favorable policies. Not only is the current U.S. administration threatening on-again-off-again tariffs on EU imports, source of many PEVs— it’s also proposing to stop planned increases in federal fuel efficiency standards and to thwart the ability of California and other states to enact regulations and incentives that have supported PEVs. Until recent uncertainties, worldwide electric drive vehicle sales continued to accelerate. In 2017, the global PEV market [including battery and plug-in hybrid electric vehicles (EVs)] grew by 65%, hitting 1.2 million PEV sales. During the first half of 2018, sales grew at an even faster pace. Total number of PEVs on the road in the world is over 3.5 million. Most PEVs are being bought in several concentrated areas: Scandinavia, Southern Germany, Austria, western cities in the U.S., and eastern cities in China. The fastest growth is in China and Europe – the U.S. seems to be waiting for adoption of the Tesla Model 3 to ramp up. Norway is the leader by a wide margin in market share, with 46% of all new car sales being PEVs. They’re followed by Iceland with 26%, and more distantly by Sweden with 7%. (Sweden aims to close the gap with Norway, so they’re adding a new tax scheme this July which should accelerate PEV sales). Fastest growth? That would be Finland, with 144% market growth from last year. South Korea (+138%), Australia (+132%), Netherlands (+122%), Spain (+118%), and Canada (+114%) are following closely. China’s already-established market grew 113% from 2017, reinforcing its global leadership in total sales. One especially exciting development is that the electric car market might be edging just a little bit closer to profitability. There were 100 models of PEVs on the market this year, most of which accounted for 2,000 to 11,000 vehicle sales per model in Quarter 1 – fairly standard production levels when automakers aren’t turning a profit. But the latest Leaf model had over 40,000 sales in first half of 2018 – if the Leaf reaches 100,000 by the end of 2018 (mass production), it probably means that Nissan is moving closer to clearing a profit with Leaf production. The expectation is that by the end of 2018, the global PEV market will make up 3% of auto sales, and continue on its upward trajectory, with several vehicles dedicated for EV powertrains. The PH&EV Research Center of ITS-Davis continues to watch the PEV market worldwide – collaborating with partners to try to understand what is moving the market in each region. A May visit to Norway and Sweden led to more insights on their markets, and a meeting with our International EV Policy Council that focused on the role of incentives, infrastructure, and consumer awareness in EV adoption. We’ll be watching the impacts of changing regulations and tariffs through PEV sales, globally and here in California. 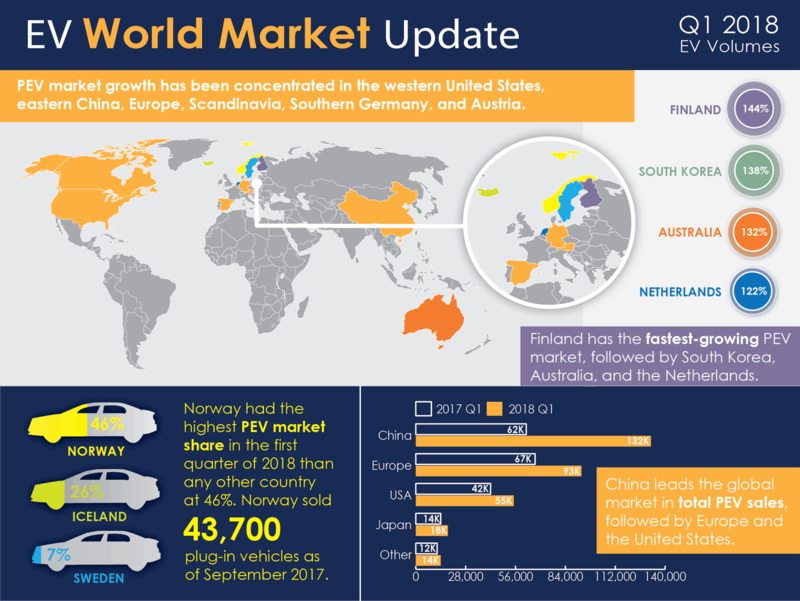 The rest of the world is on track for continued growth of the EV market. By keeping in place forward-facing policies, the U.S. also will remain plugged-in to the electric mobility future. Kathryn Canepa has been an undergraduate research assistant with the Plug-In Hybrid & Electric Vehicle Research Center for two years. She recently graduated with her Bachelor’s degree in Sustainable Environmental Design.